Sevilla is the capital city of Andalucía, one of the most visited, colorful and historically signiﬁcant regions of Spain. 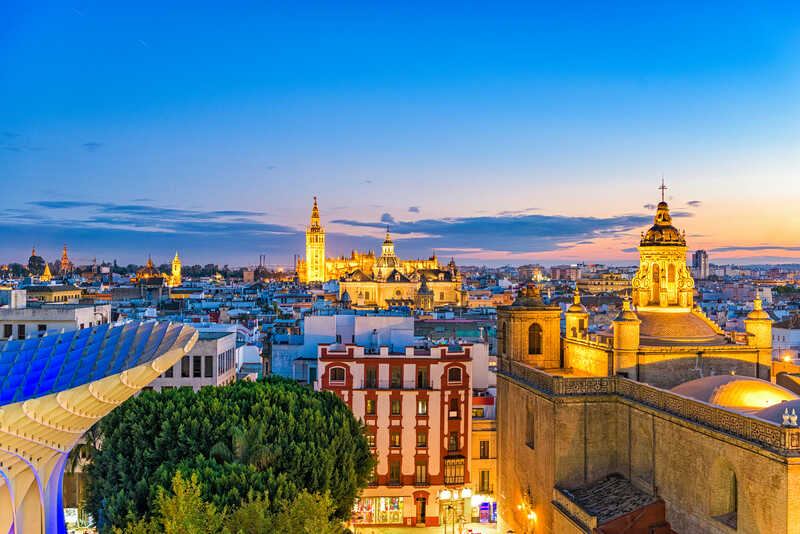 Sevilla is perhaps best known for being one of the most important Moorish kingdoms of the Middle Ages and the center of trade with the New World during the colonial era. In addition, many of the typically “Spanish” cultural phenomena that attract tourists (ﬂamenco, bullﬁghting, tapas and olive orchards) are identiﬁed with this Southern city. With over one million inhabitants, the capital city has a lot to oﬀer, without feeling congested or overwhelming like many large cities. Courses are taught at EUSA (Estudios Universitarios y Superiores de Andalucía), aﬃliated with the University of Seville since 1996. EUSA is a private school in Nervión, a fashionable neighborhood just a short walk away from historical monuments, parks, shopping centers and a major soccer stadium. In addition to a convenient wi-ﬁ network to which students can connect their personal computers and smartphones, EUSA provides a modern computer lab with wired Internet access and printing facilities. There is also an in-house library, a cafeteria on site, sports facilities, and daily interaction with Spanish students. This course will explore the diverse cultures and the interrelationship between Latin America and Spain over five centuries (from 1492 to present). The course will also study how Seville served as the cultural axis between the New World and Europe for centuries. The course is taught in English and is open to students from other disciplines. Instructor: Dr. Natalia Couste completed her doctoral studies at The University of Toronto, where she worked as a course instructor. She has done extensive research on urban spaces and participated in numerous symposiums in Canada and Spain. Based on a transatlantic perspective she carried a comparative study between contemporary Mexico City, Santiago de Chile and the Golden Age urban spaces of Madrid and Seville. She earned her Master’s Degree at the University of Western Ontario specializing in Southern Cone literature. She’s currently the acting coordinator for the Canada-Spain Summer Abroad Program. Her professional interests include international education and the development of innovative cultural programs for international students and scholars. An intensive introductory course designed to present the fundamentals necessary for understanding, speaking, reading and writing Spanish and to provide a range of opportunities for students to gain practical insights into the customs and cultural contexts of the contemporary Spanish-speaking world. Instructor: Irene Ramos-Arbolí was born in Sevilla, Spain. She holds a BA in English Language and Literature (Filología Inglesa) from the Universidad de Sevilla, an MA in Spanish from Ohio University and an MA in Hispanic Linguistics from North Carolina State University. She has recently started a Ph.D. in the field of Linguistics and Bilingualism from the Universidad Pablo de Olavide (Sevilla). Irene has been teaching Spanish to non-native learners since 2010. She has taught Spanish in the United States at Metro Early College High School, Ohio University, North Carolina State University and Ohio State University. At CINECU, she is currently teaching Health and the Hispanic Community. This course will explore facets of Spain’s rich artistic tradition by placing a special emphasis on Seville’s very own unique and extensive art history. In this course, we will survey artistic trends and developments across twenty centuries in Seville, beginning with the Roman ruins of Itálica and ending with architect Santiago Calatrava’s contemporary Alamillo Bridge. Seville’s varied artistic history will allow us to examine Roman monuments, Islamic palaces, and Gothic cathedrals. Instructor: Eric Davis was born in Laramie, Wyoming and raised in Lawrence, Kansas. He has a BFA in Fine Arts from the University of Kansas and a Master´s degree in Art from the University of Seville (la Facultad de bellas Artes de Sevilla). He is currently doing his doctorate in that same Seville University. He has worked as an artist painting in Seville since 1992 and has taught Art and art History to international students in several university programs in Seville. He has also worked as a tour guide in Spain and in Africa for the past five years.